Right now you might be in one of three different places and the process I’m going to walk you through will cover all of those. You might have no business ideas or feel that none of the ones you have had really suit you. You might have several ideas and you’d really love to do them all and you’re having a terrible time making a decision. So if you’re in one of those spots, let’s get to what to do to decide on your business idea. First I’d like to ask you to take a step back from the actual ideas themselves and to take a few minutes, writing down your ideal WORKING day five years from now. Because you’d be amazed by the number of people who would like to have a café but most definitely do not want to get up early or the number of people who come to me wanting location independence but are considering businesses that would have them tied to one place. The purpose of the exercise is for you to wipe the slate clean of any ideas you might already be developing an attachment to (because we do this, we love our ideas) and ask yourself – what do I really want? Write down what your ideal work day looks like to you. Are you with a team, do you work solo? Where are you? Are you traveling, living somewhere else or are you working from home while the kids are at school? What kind of tasks do you see yourself doing? Do you prefer to be given work to finish by yourself or do you want to be researching, or coaching, how do you envision the kinds of things you’ll be doing? We want this to be inspirational to you but not beyond what is realistically possible. There will likely be more work in the first few years of business but at the five-year mark your business would be relatively established. Essentially we are creating something to aim for in terms of what your working life will look like. If any ideas you have absolutely do not line up with what you want your life to look like then scrap them because they aren’t going to lead to you being any happier. Step 2: Release the attachment to the ‘perfect’ idea. People put an incredible amount of value into the idea. Really though everything about success and business is in the execution. Ideas are a dime a dozen. The human brain has approximately 50,000 thoughts a day, many of them ideas. The reality is your greatest chance of success is to pick an idea, preferably one that has been proven already, is simple to start and you can start pretty much right away. The idea should be proven. The idea should be simple. The idea should be possible to start pretty much right away. The highest risk ideas are the ones that had no one else is doing. it’s not profitable so the people that tried it gave up. While it is possible no one else thought of it yet it much much more likely that it’s not profitable. So instead of waiting for the perfect idea look at what is already out there that you can your own take or spin on. So detach from the concept that your idea needs to new, and definitely detach from the idea it needs to be perfect, and look for something that is already proven to work that you can improve or do differently. Are you interested in Health Coaching? Great! It’s possible to see in the market people are making money with that. The same goes for many types of coaching, consulting or service-based businesses. Choose something you know works. Rather than an unknown. You get to put your own twist on it. The more complex a business is the greater chance that it won’t work. Because it’s more complicated. Complexity adds areas where things can go wrong. When you are dreaming up your perfect business it can be natural to make it harder than it is. Instead look at how you can remove risk by making it simpler. You need to create something people are willing to pay for, that’s it. No one wants complex, but we have a tendency to make things complicated in an attempt to create value. But the value is in the outcome for the client. Not necessarily in your own process or how you create the outcome. This is particularly the case when it comes to business models. Don’t choose something that needs hundreds of customers to be profitable and would need complex marketing. The best business model for a new online business is a simple one. If the need to go to the store you take the most direct route, you don’t drive all round the back streets to make it look fancy! So we’ve talked about the idea being proven and being simple. And when I say start – I mean test. When you chose an idea to test you are mentally letting yourself off the hook of needing to get it absolutely perfect the first time. The reality is you that you definitely won’t get it perfect the first time – so just allow yourself that space. This means firstly you can give yourself permission to start and secondly it allows you space to get the idea right. My recommendation is to test the least cost, least effort version of the idea first and see if it has traction. You can learn more about how to do this in my free Masterclass – Zero To Paying Clients. Why Most Of What You’ve Learned About Online Business Is Plain Wrong. Okay, so you know you want to have something to aim for, the ideal working day five years from now, and we know the idea should be proven, simple and easy to start (or test). But what actually makes a profitable business idea? A profitable business idea that fits who you are is at the intersection of what you are good at (your skills), what you are interested in (your likes & passions) and what people are willing and able to pay for (the paying client). If don’t have any ideas at all but know you really want to work for yourself this is a great place to start brainstorming. Start with what you like, then what you are good at and look for something that a group of people would be willing to pay for. Do the ideas that you are considering have profit potential? Are they something you like, something you are good at, something a group of people will pay for as well as being proven, simple and something you could test right away? By this point you would either narrowed down your choices if you had too many and created some new ones if you didn’t have any. Now what? Now you narrow further until you have one. Remember this is an idea to test, you are dating this idea, not marrying it. Really there are two basic parameters to make a decision on at the moment – profit potential and personal fit. You might like some ideas more than others and might feel that others have more profit potential. This is a personal call but if you are new to business I would lean towards choosing the idea with the highest profit potential to get you off the ground. You can always change or adjust later, rather than going straight for the pure passion project if you aren’t too sure about exactly how profitable it would be. The next step is big. This is the step that many people never take which is why they get stuck forever dreaming up the ‘perfect’ idea telling themselves that they can only start when inspiration strikes. Meanwhile other successful entrepreneurs are already starting and making progress! The reason we do this is because it’s what we know. In our careers we are used to other people giving us permission. We get given jobs. We rarely just take them and let everyone else know it’s happening. We always get chosen – for promotions, for sporting teams, for everything. We don’t just get to say ‘Hold up world, this is what is happening. I have chosen myself for ‘whatever it is’. But in entrepreneurship you have to pick yourself. So give yourself permission to test out the idea. Not permission based on it only being when you are ready or something is perfect enough, give yourself permission to try it out. Step 6 Start. Meaning start testing. Now start, as in start testing. You’ve chosen something proven, so people have done this successfully before you so your chances are significantly improved. You’ve chosen something simple, so there is less possibility of error and anything that doesn’t work you can easily adjust. You’ve chosen something you can actually start so no more procrastinating – hooray! You’ve chosen something that suits your skills, talents, likes and passions and you anticipate has a potential paying client. You’ve understood that no one else is going to choose you. That’s your job. So now it’s time to get to it! And if you’d like to know more about exactly how to get to started and avoid all the pitfalls out there join my free Zero to Paying Clients Masterclass – Why Most Of What You’ve Learned About Online Business Is Plain Wrong. ✸ Why the standard method most gurus are getting you to follow to start your business is destined to leave you stuck, confused and overwhelmed. ✸ How the ‘alternative’ ‘blog building’ method isn’t any bet ter – unless you like working for nothing for extended periods of time. ✸ Special Circumstances Marketers and how to avoid them. ✸ The Money Three – All you actually need to start a business, tailored to you, as an individual. ✸ ACT – The process to follow to start your business with the lowest risk and highest success chances in the online space. 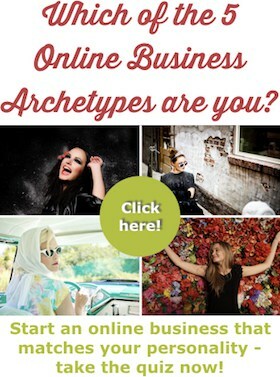 ✸ How to choose your business idea or niche. ✸ The best business model for new online business owners. ✸ The Identity Paradox – The real reason it’s so damn hard to actually get started and how to take a different approach. ✸ What fear of success and fear of failure are really about and how to reframe so you can move forward. Are you stuck on which business idea to choose? How did you decide on your business idea? Did these steps help you move forward towards your first idea to test? Loved the article. I think being passionate about a business idea is key. Being passionate about your business will help you keep going when challenges arise along the way. Passion is key but followup, action and just damn well starting is more important. Absolutely, you have to decide, then start! I would recommend downloading my Business Idea Checklist ( https://catleblanc.com/business-idea-checklist ) and rating every idea. Give it a score for each category – that will measure marketability and personal fit. Then based on the score decide. If you really can’t decide you on a personal level you just need to go to step 6 – just decide. You literally have to choose. Otherwise you aren’t moving forward. Good luck! Hi Cat, just stumbled on your website as I’ve already started my business (recently) but very unsure if it’s what I really want to do. Initially I really need it to generate some income so I can pursue training in another area. However, this might take some time so I’m itching to find either a business idea I can start making work asap…or to tweak my present business to make it more profitable AND almost more importantly to me, more pleasurable. Thanks for your information, I’m going to download it, work through it and see where I get. I’ll keep you posted! Big thanks! Thanks for commenting! I would definitely go for a business that you can start earning money with asap. If you want more help – I think this could be useful given you have a few ideas – book in a free strategy session. The link is on my work with me page. Honestly I think you and I need to talk. Shoot me an email through my contact form and we can set up a time to chat. Still not able to decide. Currently I am an employee and want to start my own work in software industry. 1 go for a product and market that but my most of the ideas are mainly free. If I add cost then may be no one going to use that. 2. Go for service industry but in that case challenge is to find work. Although I have tried both options but still not able to achieve something. Please help me out to find track. I always prefer going for a service-based business. What kind of services are you thinking of? The challenge of getting sales or finding work is part of business but if you go for the right service there will be people that want it. So it then becomes about convincing them you are the right fit – which is all about branding (messaging) and sales. I would suggest checking out my free business idea training at catleblanc.com/idea to get further insight. My concern could be different from others’. I have been trying to get a job in govt. Sectors for almost 3 year, but couldn’t make it till now. I am really frustrated with my performance. I have tried my best to make that happen. But i am done with it now. Now i want to start a business (or i want to make money). But don’t what to start and where to start from.i really need your guidance. Btw my hobbies are(which i kept aside for a long time for the sake of my preparation for papers)are i love interacting with people, travelling. I am kind of creative person but so many failures have made it very difficult for me to believe in it. Looking forward to hear from you. This is my problem right now. I want to start a business but I don’t know how and what to start. I found this article very helpful. Thanks for sharing this. Thanks for a thorough and sensible article! Thanks for commenting and I’m really glad you enjoyed it!